I feel like by now everyone and their grandmother has played Evolve, 2K's upcoming four-versus-one monster hunting game. It certainly feels that way, especially with how many people jumped into the alpha last month. But 2K had a few last things to show off prior to the game's February 2015 launch—namely, a third monster and an entire singleplayer mode. Well, "singleplayer mode." 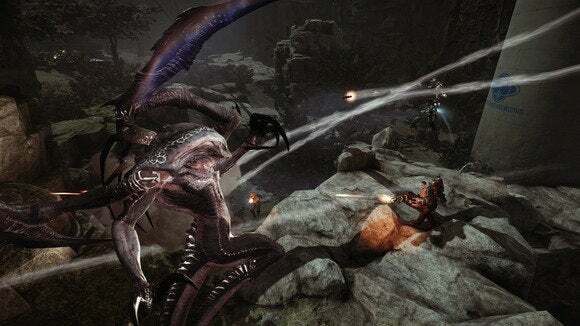 You'd be forgiven for thinking that the first monster 2K showed off, Goliath, is the central focus of Evolve. After all, it's the one 2K pushed for months before showing off the Kraken, and it's the only one most people have played. 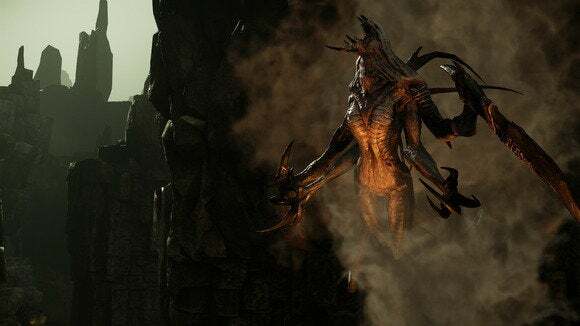 But the other two monsters in Evolve's repertoire are just as important, and in fact I think I like playing the newly-unveiled Wraith the most. 2K explained the Wraith to us in traditional RPG terms. If the Goliath is your fighter class, the Kraken is your wizard, and that makes the Wraith a rogue. High damage, low health, and lots of trickery—those are the basic tenets behind this third monster class. It's a class designed to get in, cause a lot of damage, and then get out again. Instead of leaping or flying around, the Wraith teleports into action and uses scythe-like claws to tear people apart. Or it teleports into action, snatches one of the hunters from the group, and then darts back out again to kill the hunter in solitude. Wraith can also turn invisible while sending out a duplicate of itself, allowing it to go back into hiding while the Hunters are stuck fighting, or it can unleash its Supernova—basically a big dome that makes Wraith attack faster in a blur of arm-knives. It's the psychological mind-games of Predator mixed with the fury of the Alien, and it's terrifying. A good Wraith player can absolutely wreck an uncoordinated team, darting in and out and picking off the Hunters one by one. Of course, it's balanced by the aforementioned low health. 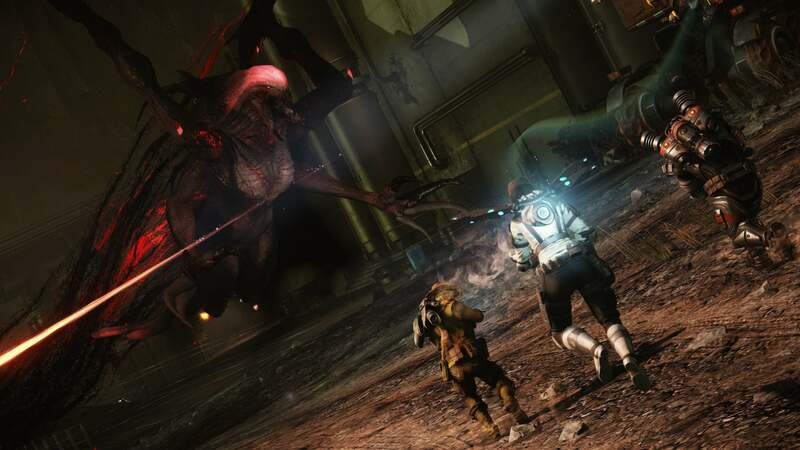 A well-coordinated team can take down the Wraith quickly, limiting its effectiveness. 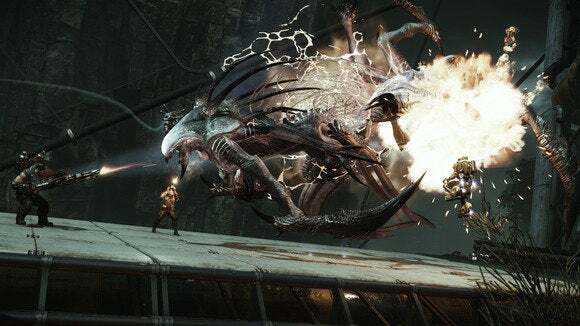 On that note, I played a bit of singleplayer Evolve. Now, I'd like to point out that it's less a "true singleplayer campaign" and more like "playing the game with bots." Considering how few games implement bots these days, however, I'm pretty happy that Evolve has them. I only played as the monster against four Hunter bots, and while they didn't play exactly as I'd expect real humans to play it was close enough you could probably fool an unwitting player. The mode that's most campaign-like (or like Left 4 Dead, for that matter) is Evacuation, which stitches five maps together into a "story" of sorts. The first map is always the standard Hunt gametype, the last is Defense, and the middle three are up to the player (or a vote, in multiplayer). These maps also tie together. The winner of each round unlocks a "Map Effect" for the next round. By destroying the power plant, for instance, I caused pools of radioactive energy to show up on the next map and hurt the Hunters. If the Hunters had won, they would've unlocked turrets on the next map instead. Other map effects might cause massive man-eating eels to appear, or even a second AI-controlled Goliath to help your team out. Evacuation mode brings up a lot of interesting scenarios as the monster. While I was encouraged to play Wraith for the first map to try it out, you quickly find that the choice of monster can drastically effect how you play. This was hammered home most for me on the Defense map, where I chose to play as the Wraith again. After winning four matches in a row I lost the Defense map because the Hunters respawn until the game is over, while the monster simply dies. Constantly respawning hunters eventually whittled away the Wraith's small pool of health, and I probably would've been better taking Goliath's strong carapace into battle. If you somehow haven't gotten to play Evolve yet, good news: You can soon, though Evacuation mode won't be included in the next test. While the Xbox One is the only platform getting an Open Beta, the PC will have another closed test starting January 16. If you were in the last closed test, you're already in this one. Furthermore, if you own BioShock Infinite or Left 4 Dead on PC you're also included. And then it's just a few short weeks until Evolve is actually released. Insert pun about hunting season being open.